Includes one woman's wig styled in a prom pageboy style with a middle part. Wig is available in auburn, black, blonde, brown, dark blonde, dark brown, dark gray, frosted blonde, henna red, light brown, light gray, medium brown, medium gray, platinum blonde, strawberry blonde, or white. The wig features an elastic band on the inside for comfortable one size fits most sizing. 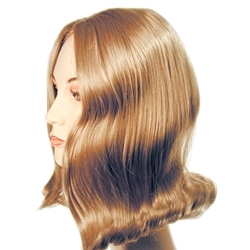 This wig can be used for a number of different characters including Donna Reed or Jackie Kennedy. The wig can be teased up high if so desired. We have also used this wig to create the look of a younger biblical man for Christmas, Easter, and other biblical shows including Jesus and John the Baptist/Judas in Godspell.